Life is like a Garden: How to enjoy Spring in Eureka Springs. A garden is a magical place full of beauty and wonder. 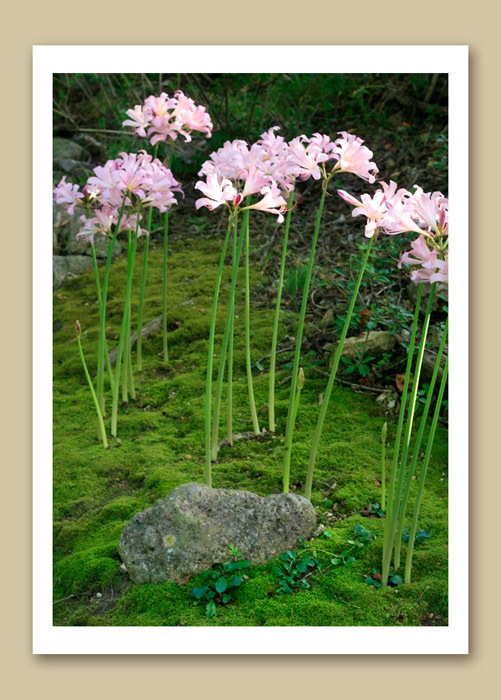 Life in Eureka Springs is like a garden…you’ll dig it! Here are some hints on how to enjoy spring in Eureka Springs. Pocket garden surrounding a natural spring in Eureka Springs. Photo by Edward Robison III. To be healthy and happy you’ve got to soak up some sun. Catch some rays during the Eureka Springs Annual Victorian Classic. Walk or run through historic downtown. Victorian characters keep you on the right path as you enjoy one of the most scenic races in the country. There are plenty of beautiful outdoor spaces to explore around Eureka Springs. The kids will enjoy a day at Nature Exploration Camp. Hike or bike the paths at Pea Ridge National Military Park. Learn more about the Civil War in the Ozarks with the Civil War Flags Exhibit and the Commemoration of the Battle of Pea Ridge in March. Tulips surround Crescent garden bench. Photo by Edward Robison III. 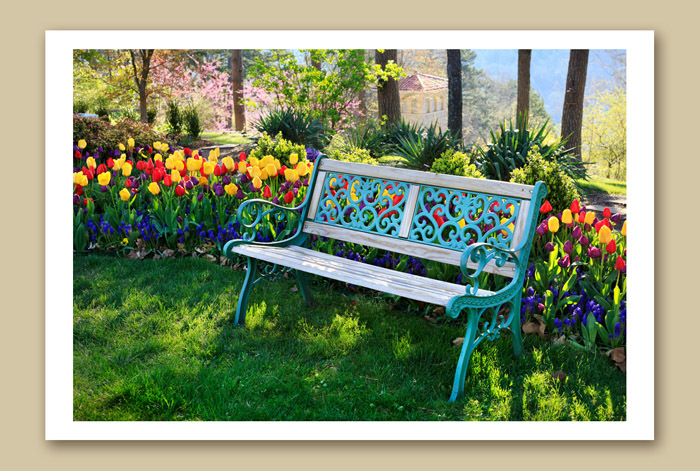 Colorful flowers are the center of attention in any garden and downtown is the center of attention in Eureka Springs. It is where the most colorful celebrations are held. Have fun with Spring Break activities in downtown Eureka Springs. Attend a Re-art Party or fly a kite in the Turpentine Creek Kite Festival. Don’t forget to wear green if you come to cheer on the St. Patrick’s Day parade. 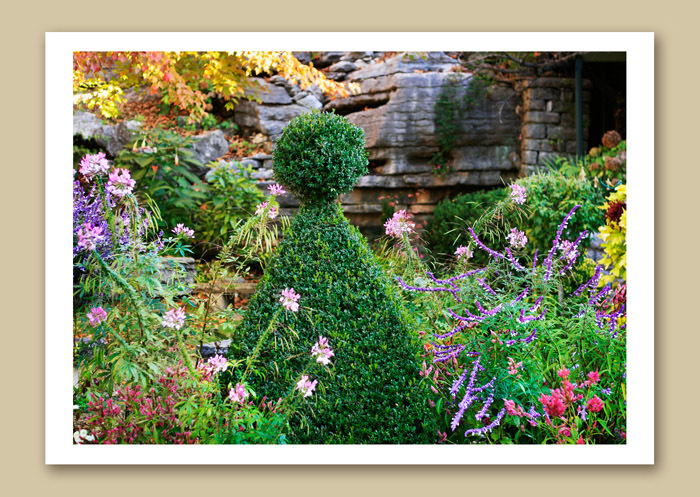 Gardens have inspired great artists for centuries and so has Eureka Springs. Named a Top 25 Arts Destination by American Style Magazine, Eureka Springs is home to world class art galleries and hundreds of working artists like Edward Robison III. The arts are alive in Eureka Springs. Watch Intrigue Theater in the historic Aud. See Michael Johnathon of WoodSongs Old-Time Radio Hour in concert or sit in on an authentic hootenanny. Enjoy a glass of wine as you preview the antique trail show in March. Explore the Arkansas Art Trail or visit the nation’s newest art museum with a short, scenic drive to Crystal Bridges Museum of American Art. Crystal Bridges offers guided tours, gallery talks and more. Flowers bloom in Eureka Springs. Photo by Edward Robison III. Enjoy great food and drink in Eureka Springs. With an active local food movement, Eureka Springs offers organic and no till gardening workshops. Get together with other local foodies at the Eureka Springs Farmers Market or attend the Dig In Festival in nearby Fayetteville. Watch classically trained Chef Karen Gros prepare French cuisine with produce from local Foundation Farm. Taste the best soups of Eureka with Souper Soup. If you love beer, attend the Breweriana show in March at the Inn of the Ozarks. It is easy to enjoy life in Eureka Springs. To see what else is happening this spring, visit EurekaSprings.com. Eureka Springs is a popular spring break destination and weekend lodging fills up quickly. Consider visiting Eureka Springs through the week and take advantage of great spring vacation deals that bundle Eureka Springs lodging and attractions. Visit the Official Greater Eureka Springs Calendar of Events for ideas on what to do in Eureka Springs. Don’t miss any of Eureka Springs’ best attractions, restaurants, galleries, shops and spas. 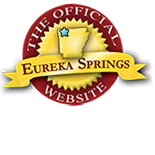 Want up to date information on Eureka Springs events? Sign up for our newsletter and follow us on Facebook or Twitter. Visit Eureka Springs anytime you get a chance. It is fun in the summer, fall and winter too! This entry was posted on March 1, 2012 by estcblog in Arts & Culture, Crescent Hotel, Culinary Adventures, Festivals, Fun Downtown, Musical Adventures, Shopping, Things to Do and tagged beaver lake, Black Bass Lake, Crystal Bridges Museum, culinary, downtown, Eureka Springs, Eureka Springs School of the Arts, Fine dining, food, gardens, historic downtown, Lake Leatherwood, local culture, natural springs, Outdoor, photography.